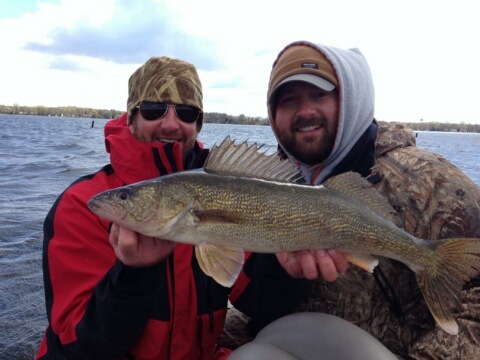 Trophy Encounters Guide Service | Opening Day Walleyes & Wind. Saturday at midnight the fishing season kicked open. A few minutes later, so too did the wind. This year will forever be remembered as the year for wind and ice. I've fished in crappy weather before, but this was brutal. Being tough guys, we battled it all day long. After all, walleyes are always worth it. My fishing crew consisted of Bails, an opening day regular. "New Chad," which as the name suggests, made his first opening day start. And, last but not least, Eric, "the lone wolf," Wolf. A motley crew of walleye lovers, for sure. We opted to keep our tradition going and started at midnight. Lake Minnetonka was our lake of choice. Chad kicked off the event with Nitty Gritty Dirt Bands, Fishin' in the Dark, at 11:57pm. Then, at 12:00 on the dot, we were down to business. Our first spot was fish less. At about 12:15 we moved on, and as we motored to spot number 2, the lake erupted. Gale force winds literally knocked us sideways. It blew so hard that it would have been miserable even if the walleyes were jumping in the boat. We opted to take a skunk to bed and get some rest before sunrise. The morning started slow and cold, but as the sun warmed up, so did the walleyes. Well, technically just Bails turned on. While I did my best circus act to hold the boat on the spot he landed 3 dandies. Interestingly enough, all three were big males, all in the 24 inch range, and all spewing "white stuff" on the bottom of the boat. Getting rid of the skunk was all we really wanted, then we pulled the plug on our morning. After lunch and a nap, we returned for the evening bite. Eric instantly boated his first walleye. The skunk remained for Chad and myself. Soon, they placed bets on who would catch a walleye first. Bails put his money on Chad and Eric took yours truly. Fortunately, Eric didn't have to wait long to get paid. My drought was over (insert a Hallelujah)! I boated my first, followed by a second, which also happened to take big fish honors for the day. She was a spawned out female over 27 inches in length. I thanked her for the sunset thrill, then sent her on her way. As darkness approached, "New Chad," was the only man without an 'eye. His depression was reaching new depths when suddenly he hooked up. It was a big fish, possibly larger than mine. Just as we were about to catch a glimpse, the line snapped. If he hadn't fished so hard all day, it would have been hilarious. Seeing the defeat in his eyes, we could only laugh at half throttle. He escaped the full blown harping that we normally dish. As he re-tied his line we talked about what we could have done differently. "Nothing," he said. A new jig and two casts later the man was hooked up again. Thank goodness, this time, the walleye made the net. With Chad's fish, we called it a day. Mission accomplished. 4 tired boys left the lake with a handful of new walleye tales, and wind burnt faces. In total, we managed 8 walleyes. 4 for the jar, 4 for the photo album. A far cry from a normal year, but considering the conditions, we called it a success. Another opening day is in the books. Until next time, keep on livin' the dream!